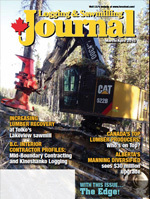 Logging & Sawmilling Journal March/April 2015 - Canada’s lumber producers expanding further — but in the U.S. There is a united front on the part of Canada’s lumber producing provinces for extending the Softwood Lumber Agreement, but the U.S. government—and the U.S. lumber industry—have yet to say where they stand, even though the agreement expires this October. Tolko Industries’ Lakeview Lumber Division in Williams Lake, B.C., has recently seen some significant upgrades that are already delivering results in lumber productivity and recovery. Safety has always been a priority for logging contractor Reid Hedlund, of Mid-Boundary Contracting—who is also chair of the Interior Logging Association—and though the industry has seen success at reducing the number of accidents, it continues to take ongoing effort, he notes. Top Lumber Producers – Who’s on Top? Logging and Sawmilling Journal’s annual listing of Canada’s Top Lumber Producers, produced in co-operation with industry consultants, International WOOD MARKETS Group. Visitors to the upcoming Canada North Resources Expo, being held in Prince George, B.C. May 29 -30, will enjoy an extensive range of displays, an excavator rodeo, sawmill and wood processing equipment demos—and perhaps even a grapple skidder show. Alberta’s Manning Diversified Forest Products has invested $30 million in sawmill upgrades, new equipment that delivers higher production and more efficiency—and green power. B.C.’s Kineshanko Logging recently celebrated its 40th year in logging, and all through that time their equipment has only been one colour: Cat yellow. A careful approach to logging by contractors such as Jessup Bros. Forest Products is yielding jobs, good quality timber and an ample wood supply from Ontario’s well-known Algonquin Provincial Park—timber that also helps to sustain jobs at local sawmills. The upcoming B.C. Saw Filer’s Association conference in Kamloops, B.C., features a solid line-up of speakers—and the opportunity to see the latest in saw filing equipment from equipment manufacturers. 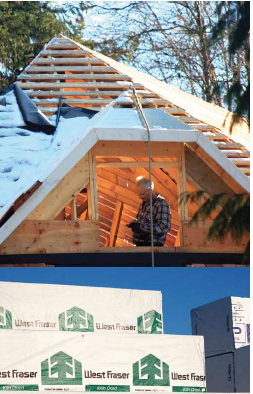 B.C.’s Thompson River Veneer Products Ltd is benefiting from the general upturn in the economy, and sees demand for its plywood growing with building codes now allowing an increase in wood structure heights. Tony Kryzanowski says a lack of joint ventures may be stunting the growth of the forest industry. Canada's lumber producers expanding further — but in the U.S. The annual survey of Canada’s top lumber producers by International WOOD MARKETS Group Inc. shows familiar faces at the top—Canfor and West Fraser—but also that Canadian lumber companies are now a big part of the U.S. industry. The 2014 annual survey of the top Canadian lumber producers by International WOOD MARKETS Group Inc. reveals ongoing investments (not all in the ‘home’ country) in acquisitions, expansions and restarts. For the entire Canadian lumber industry, output volumes in 2014 were slightly higher (+3 per cent) as compared to 2013, but the top 10 Canadian producers recorded lower production (-1 per cent) in 2014 with a resulting contraction in Canadian market share. Alberta shipments were up 180 million board feet to 3.7 billion board feet (+5.2 per cent). B.C. Coast production rose by 103 million board feet to 1.4 billion board feet (+8.2 per cent). B.C. Interior shipments were actually lower in 2014 (-50 million board feet or -0.4 per cent) due to the respective closures in 2014 of Canfor’s Quesnel sawmill and West Fraser’s Houston sawmill (which were balanced by various mill upgrades in the region and the restart of Hampton’s Babine sawmill). Clearly, the mountain pine infestation has been a game-changer for Interior producers. From 2010 through 2013, the top 10 Canadian producers consistently grew their shipments at a faster pace than the overall Canadian industry. This trend was broken in 2014: softwood lumber shipments by the top 10 Canadian lumber producers grew at a slower rate than Canadian shipments as a whole (-0.8 per cent for the top 10 versus +3.1 per cent for Canada). As a result, the Canadian top 10 saw their output ease marginally from 15.58 billion board feet in 2013 to 15.45 billion board feet in 2014, while their share of national production slipped to 63.8 per cent from 66.3 per cent in 2013. This lower production trend is an indication of fibre constraints (particularly in the B.C. Interior but also in Quebec) limiting growth opportunities for producing lumber. The U.S., conversely, has been an attractive option for some of the leading Canadian producers in that it offers more readily available/affordable timber in close proximity to recovering housing markets. Turning to the rankings of the top 10 Canadian firms (table 1), six were based in Western Canada (representing six out of the top seven) and collectively produced 11.8 billion board feet (48.0 per cent of Canada’s total shipments), a decline of 357 million board feet from 2013. Output of the top four eastern Canadian producers was 3.66 billion board feet (15.1 per cent of Canada’s shipments), 226 million board feet more than the previous year. The top five Canadian producers were Canfor, West Fraser, Tolko, Resolute and Interfor, with their order unchanged from 2013. However, output was lower for the top three due to their B.C. interior mills finding less commercial sustainable timber as a result of the mountain pine beetle infestation. The top five Canadian companies produced a total of 11.6 billion board feet (48.0 per cent of Canadian lumber output), versus 12.1 billion board feet (51.4 per cent) in 2013. Canfor retained its lead spot despite its output dropping by 11 per cent (to 3.74 billion board feet) due to the sale of its Daaquam mill (Quebec) and the closure of its Quesnel mill. In close second spot was West Fraser at 3.48 billion board feet (-3 per cent, due in part to the closure of its Houston mill). Tolko placed third, but its output slipped by 3 per cent to 1.89 billion board feet. Fourth-place Resolute saw a 7 per cent increase to 1.59 billion board feet, with the gain coming despite its Quebec mills having had to adjust to AAC reductions and a timber reallocation policy. Interfor was able to raise its output by 8 per cent by expanding production at its five B.C. mills (three Interior and two coastal ones) to 943 million board feet. Leading the “Canadian invasion” into the U.S. have been West Fraser, Canfor and, most recently, Interfor. A decade ago, West Fraser was the only major Canadian producer with U.S. mills (table 2). As of the end of 2014, Canfor, West Fraser and Interfor were collectively running 31 mills in in the U.S. that produced 3.6 billion board feet—31 per cent of their combined total North American production. 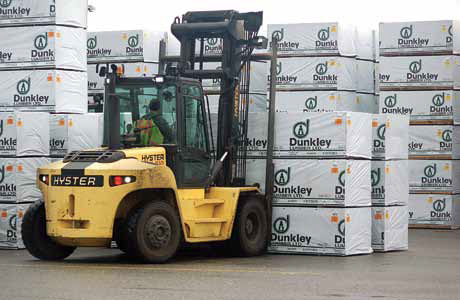 Interfor’s March 2015 acquisition of four mills from Simpson Lumber is projected to raise its U.S. capacity to two-thirds of its total output. Earlier in 2015, Canfor acquired a 55 per cent interest in two sawmills in Georgia (Beadles Lumber and Balfour Lumber), while West Fraser purchased Bibler Brothers in Arkansas. The WOOD MARKETS survey shows that the largest U.S. producers (and especially Canadian firms with sawmill ownership in the U.S.) are continuing with their investment strategies aimed at increasing their capabilities and mill efficiencies in preparation for the approaching U.S. lumber market recovery. West Fraser’s ownership of American sawmills now has the company ranked at fourth spot in the U.S. with output up 15 per cent to 1.82 billion board feet in 2014, reflecting the addition of two Arkansas sawmills in the first half of 2014, along with the full-year operation of its opened Florida mill. 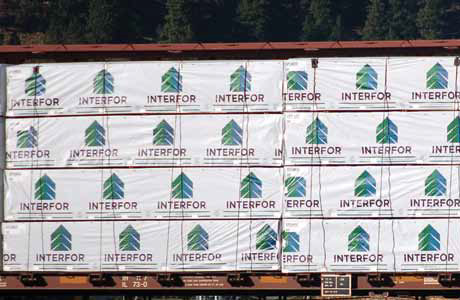 Interfor is now ranked at #9 in the U.S. with output of 1.24 billion board feet at nine mills—this excludes its 2015 acquisition of Simpson Timber’s four U.S. sawmills. 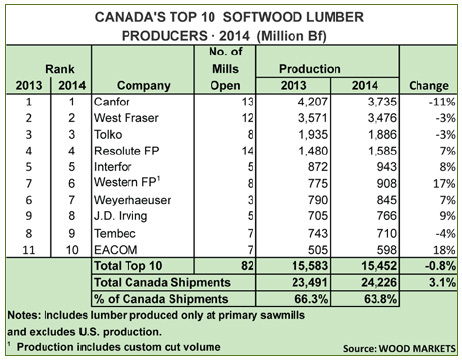 Canfor is ranked at #7 in the U.S. and is expected to add to its U.S. sawmill ownership in 2015. In late Q1/2015, the North America industry was back in a familiar position: there was too much production vs. demand. Lumber prices and sawmilling margins have generally been very attractive for mills all over North American since 2012, where supply and demand has stayed in a reasonable balance. However, higher margins result in higher cash flow and at some point this cash gets reinvested in sawmills. This then results in higher production and lower cost mills that need to run to pay back their investments. This scenario is partly responsible for lumber production increases that are not tied to market dynamics. While there still might be some lean inventories in the U.S. supply chain, sawmill inventories have been rising in Q1/2015. And against this background, there is the first wave of Swedish lumber production arriving in the U.S. market, driven by currency exchange devaluations vs. the U.S. dollar, as well as few other export market alternatives to ship lumber to. So, whenever the Swedes start shipping into the U.S. market, the Germans may not be too far behind. When these regions start to become competitive in key export markets, they can have some staying power due to the differences in sawmilling technology employed. Simply put, European mills serve a multiple of markets that all require different sizes, lengths, grades and specifications. To be able to produce lumber for these many European and export markets, European sawmilling technology has evolved to be different to North American technology—this has impacted not just costs, but allows for wider product lines, expanded markets and improved margins! And the opportunity to set up mills and operate extended production runs for the U.S. market is something that Europeans have been waiting for since 2006. WOOD MARKETS has been visiting European mills since 2000 and we know what some of the export market strategies are for some of these countries. However, with log costs also very high in Europe (at least double U.S. log costs), the European sawmilling strategy is to reduce fall-down grades and maximize value from the expensive logs. To accomplish that, all mills first sort and grade their logs through a log merchandizing line where logs are scanned and typically sorted by diameter class, grade and length. Many mills have 60 to 80 log sorts; some have 160. Since the logs are sorted into batches of similar diameter, grade and length, the optimum product and market solutions are matched up to these log sorts to maximize value back to the log. These log batches are run into fixed setworks in the mill, as since the logs are already pre-sized and graded, there is no need for moving and shifting setworks in log breakdown equipment as is extensively used in North America. With fixed setworks and using batched logs, European mills can achieve higher lumber production output per hour, day, week, etc., as compared to North American mills. Instead of having a 2 to 3 metre (6 to 9 foot) gap between logs, European mills can have 0.5 metre (1.5 foot) gap that allows for greater linear production per hour. As well, processing pre-graded logs yields very little low grade lumber from every production run, optimizing value. The cost advantages of European sawmilling have been documented in WOOD MARKETS bi-annual Global Timber / Sawmill / Lumber Cost Benchmarking Survey since the first issue was released in 2001. In essentially every survey (based on U.S. dollars), European mills continue to have the lowest sawmilling costs in the world (US$/Mbf or US$/m3). And in the current situation with the Euro and the Swedish Krona depreciating 19 to 20 per cent since July 1, 2014, the cost advantages of European mills are becoming ultra-competitive today in export markets, and potentially the U.S. market. The other key advantage of European sawmilling technology is that mills are extremely flexible —they can essentially cut any size (thickness and width) of lumber that is being requested based on the sorted log inventory. As a result, European mills are extremely versatile in selling to almost any market in the world since they are not constrained by fixed sawing programs or concerns about fall-down grades. As well, European sawmilling technology can easily produce square-edged dimension lumber and studs (i.e., home centre grade) and provide specified lengths (like a truckload of 16-foot) since the mills take orders from the pre-sorted log (diameter, grade and length). As a result, customers in Europe as well as in Japan, China, the Middle East, North Africa, and also the U.S., have a strong preference in dealing with sawmills that produce lumber with flexible European technology. The answer is quite simple—they can produce lumber to the exact specifications of the customer. And with the lowest sawmilling costs in the world, you can see why European lumber is found all over the world, limited only by market price (which is often a constraint due to the much higher European log prices). But with a world-class European technology sawmill now operating in Florida, this could become a game-changer for the U.S. industry. Logs costs are currently half the price in the U.S. South as compared to parts of Europe. This means that not only will a sawmill featuring European–technology equipment located in the U.S. South be very competitive in the U.S. market, it should be very competitive in a number of key export markets. U.S. South (as well as Canadian SPF) mills have traditionally had restricted export market opportunities due to their inflexible sawmill technology, aside from older headrig mills. To fully understand and see the differences between European sawmilling technology (and the new U.S. South mill now starting up) and that in North America, you really have to see sawmills in operation. WOOD MARKETS is offering this opportunity through its Eastern Austria Industry Tour on June 18 and 19. This is being held in conjunction with WOOD MARKETS’ Vienna International Wood Products/Markets Conference & Expo in Vienna on June 17 as well as the bi-annual Schweighofer Prize Awards Ceremony and Reception (June 16). There is a second option for an industry tour to visit Holzindustrie Schweighofer’s sawmill operations in Sebes, Romania that also features some of the best European sawmilling equipment that operates 24/7. More information on all of these events can be found at: www.woodmarkets.com/conference/global-conferences/. This article was summarized from WOOD Markets Monthly International Report (March 2015) by Russ Taylor, President, International WOOD MARKETS Group.